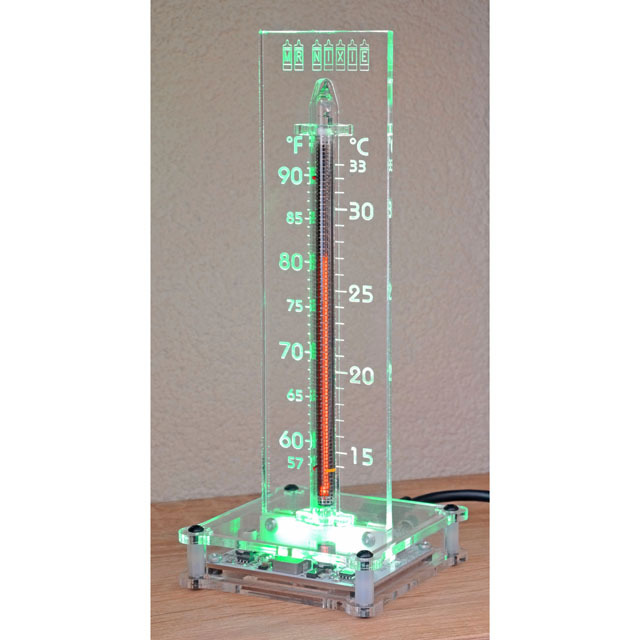 A Russian Bargraph-Nixie-tube shows similar like in the good old time a mercury thermometer the room-temperature with a variable glow hight lenght; however with NixieTherm you have a wonderful red-orange glow. At the same time six RGB auto colour changing LEDs, which illuminate the scale from the botton, give a never ending play of millions of different mixed colours. It is the eye-catcher par excellence – at your home, your office or as a very specially gift idea for Birthdays or Christmas. The word "Nixie" was formed from the words Numeric Indicator eXerimental No. 1 and first introduced 1954 by Burroughs Corporation from USA as a brand name for numeric displays. Nixie tubes were used until the mid of the 1970's as displays in measuring devices, calculators, TV sets and the very first computers. 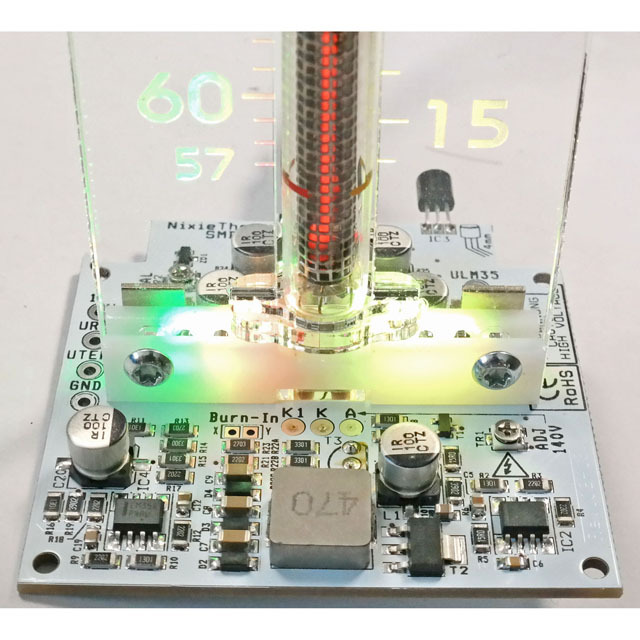 The evolution of modern style display types like Numitron, VFD, Light Emitting Diodes and Liquid Crystal Displays, which have a very low supply voltage (battery power supply) eliminated these Nixie tubes from the market, and they are not produced anymore. In the former USSR Nixie tubes were produced as surplus in vast quantities until the beginning of the 90's – and from this sources is this tube. But even these supplies are now running short. And when they're gone, they're gone. The tube is taken from "NOS", what means New Old Stock. They were never used before and spent their first thirty or more years forgotten in some Russian warehouse. The principle of the Nixie tubes is based on a cold cathode discharge and it is used today a million times e.g. in small neon bulbs of illuminated mains power switches. This Bargraph tube in the NixieTherm is a special construction of such a neon bulb, it can produce a current depending variable glow hight lenght when a current regulated voltage of around 140 VDC is applied. 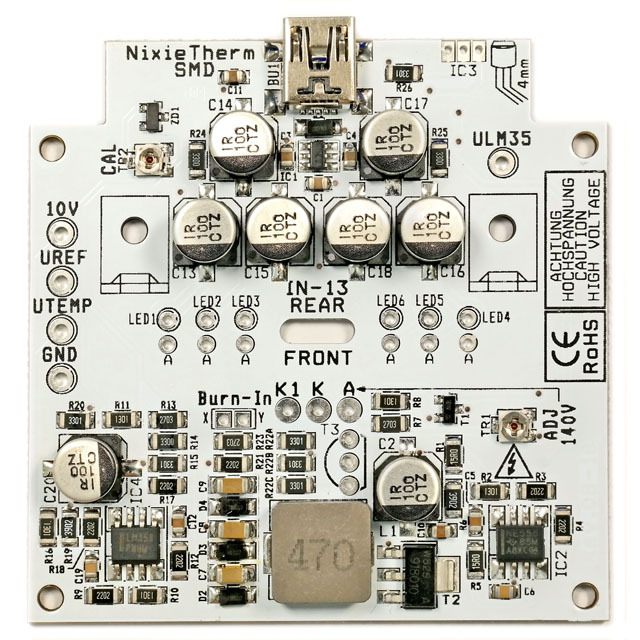 Often were asked: "What is the lifespan of a Nixie tube" and than there is a simple answer: "Have a look at your illuminated power switch of the multiple outlet strip. How many years does this small neon bulb lights continously without any aging issues?" Only analogue technique is used. The electronic circuity runs without any processor or other digital ciruity. Power supply via USB port. Power consumption is as less as NixieTherm SMD can powered up from a simple USB port. No driver needs to be installed. NixieTherm only "catches" the supplied voltage. 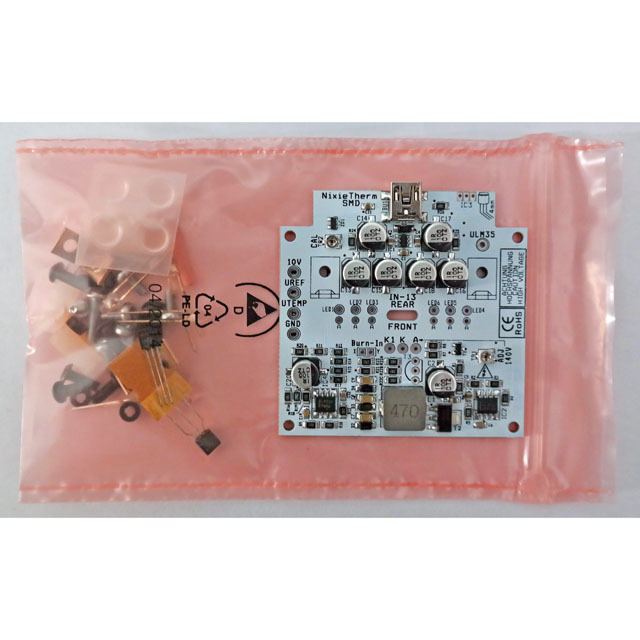 As an alternative, NixieTherm SMD can be powered from a standard Mini-USB charger. 50...250 mA @ 5VDC depending on the lenght of the glow coloumn thanks to the high efficiency voltage doubler in the HV supply. 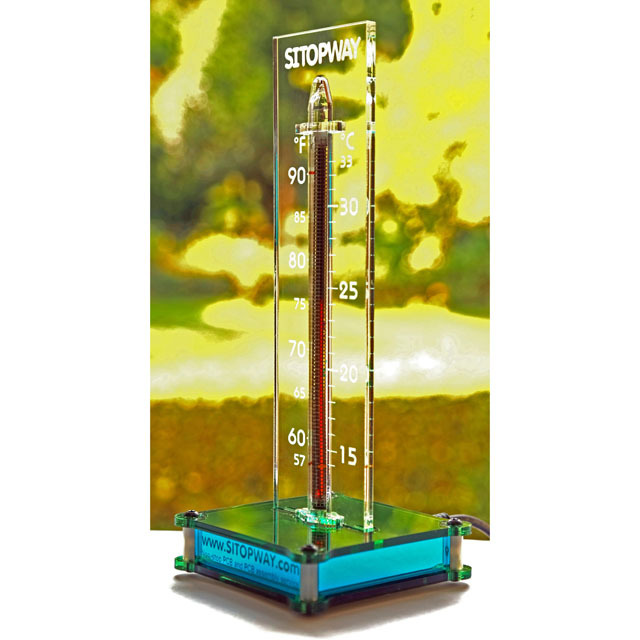 +/- 0.5°C (+/- 1°F) adjustable. Thanks to the SMD pre-assembly and soldering only a small handful of through hole parts needs to be fitted and soldered. And last but not least a simple USB port on your PC or an USB charger to power up NixieTherm SMD. Your engraved logo on the scale or the case in special colors? When ordering 5 or more NixieTherm SMD we can offer you without extra charge an individual engraving of the scale with your company logo or manufacturing the case in many different colours. Mirrored: Silver / Natural, Anthracite, Gold, Bronze, Orange, Red, Dark Red, Purple, Pink, Green, Yellow, Light Blue, Dark Blue and Avocado. This would be really an absolute unique gift for your best clients! Please contact us if you are interested. The original NixieTherm Mk I was introduced in 2011 (Download Design Protection) and were sold in the meantime more than 850 times in version Mk III. Now another batch needed to be re-ordered with causes in a PCB and enclosure redesign, which means that the PCB and the enclosure are now smaller and the board is nearly fully SMD assembled and soldered. Therefore only a few through hole components needs to be fitted and soldered by the customer for an easier and faster assembly pleasure. And the selling price could be decreased significantly, too. In the meantime there are a lot of cheap copies - specially from Lithuania, Ukraine and - with faked accounts now also from Italy - on the market, but they have never reached the top quality of the German original Mr.Nixie's NixieTherm.